For less important doodles in text, the kind that go no farther than your desk or refrigerator door, the tactile pleasure of typing old school is incomparable to what you get from a de rigueur laptop. Computer keyboards make a mousy tappy tap tappy tap like ones you hear in a Starbucks — work may be getting done but it sounds cozy and small, like knitting needles creating a pair of socks. Everything you type on a typewriter sounds grand, the words forming in mini-explosions of SHOOK SHOOK SHOOK. A thank-you note resonates with the same heft as a literary masterpiece. The sound of typing is one reason to own a vintage manual typewriter — alas, there are only three reasons, and none of them are ease or speed. In addition to sound, there is the sheer physical pleasure of typing; it feels just as good as it sounds, the muscles in your hands control the volume and cadence of the aural assault so that the room echoes with the staccato beat of your synapses. Posted on August 9, 2013 August 10, 2013 Author DeannaCategories News & Views, Office & Den, Schools, The Hobby Of CollectingTags collecting, Movie Stars, old letters, typewriters, useful collectibles, vintage livingLeave a comment on I Am TOM. I Like to TYPE. Hear That? Recently, he and his find were featured at Frank De Freitas’ Typewriters Around the World, a site devoted not only to showcasing typewriters but to showing off their typefaces or fonts by having folks mail in letters typewritten on the machines. We’re down to our final  days in the Kickstarter.com fundraising… and we are woefully behind out goal of $20,000. We are presently at $5,631 with 34 backers. We’ve shot 17 interviews with typewriter repairmen, users, collectors, authors, artists, street poets, historians and enthusiasts, documented two type-in events and have shot in LA, SF and the Phoenix/Mesa, AZ area. We’ve photographed famous machines once owned by John Lennon, Jack London, John Steinbeck, John Updike, George Bernard Shaw, Ray Bradbury, Tennessee Williams and Ernest Hemingway. One of the incentives we’re offering at the $5,000 donor level is to type a letter on a typewriter owned by Ernest Hemingway that he used to keep in Cuba. It’s in Los Angeles now in the Soboroff collection. Of the $20,000 we’re hoping to raise, none of it goes toward salaries. It’s all for travel and post-production. More details and means to donate can be found here, so, typewriter collectors and fans, take action! I’ve been reading about dead technology, things like wind-up watches, letter writing and typewriters. Then I found a link to people who collect typewriter ribbon tins. This got me thinking, it’s not just the technology or industry itself which dies but all the little things that go along with it. I had an old typewriter, or my family did anyway. 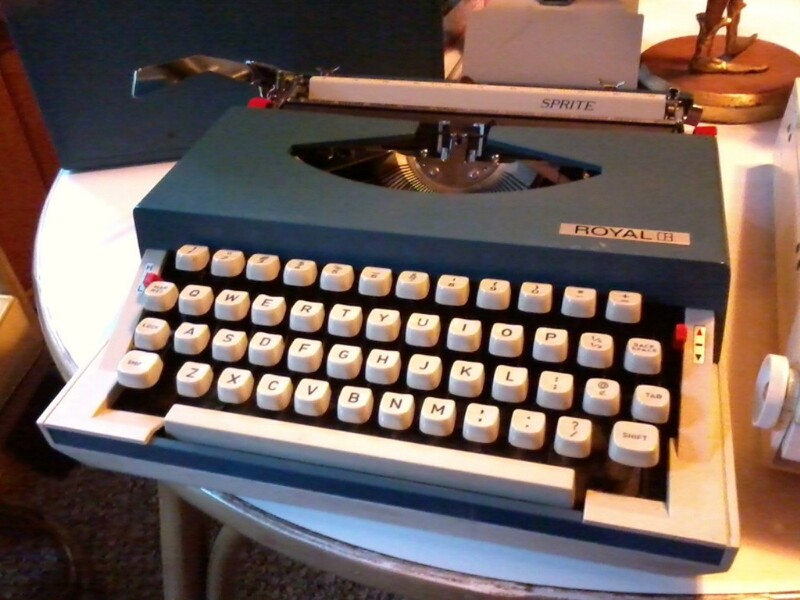 I can remember the smell of the ribbon and the tinny smell of the old typewriter itself. The ribbon was wound around two spools and would gradually wind back and forth between them until someone decided the ink had become too faded and replaced it with a new ribbon. That’s where the fancy ribbon case would come in. It would hold the fresh ribbon and spool. As products go, what could be more banal than the lowly typewriter ribbon? In an effort to stand out from the crowd, ribbon manufacturers covered their products’ tins with colorful type and graphic elements. Art Nouveau, Art Deco, and Mid-century Modern graphic design are all well represented. Some tins feature fanciful illustrations having absolutely nothing to do with typewriters, ribbons, writing, business or anything remotely connected with typing. As the industrialized culture of international business spread throughout the 1960s and 70s, soulless, bland graphics and cheap cardboard packaging took over. The tin was no more. Uppercase Collection of Typewriter Ribbon Tins on Flickr. 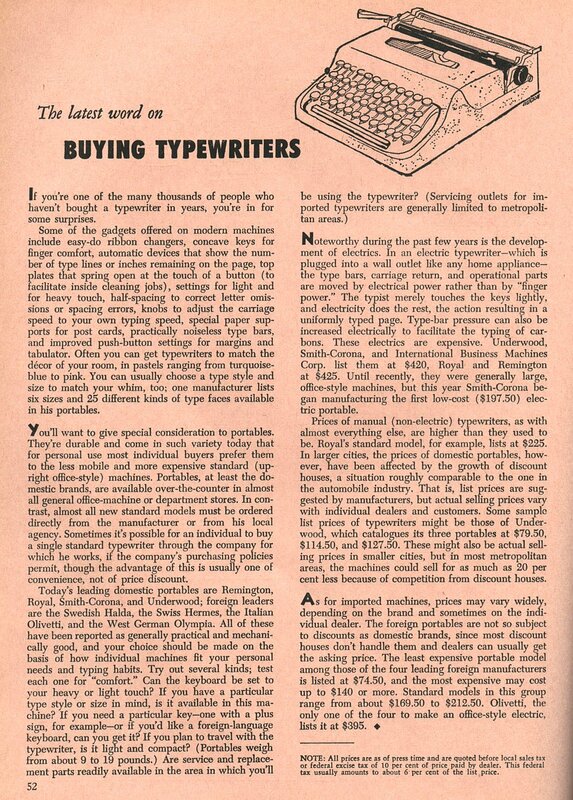 I continue to be delighted with vintage magazines, this time another article in that November 1957 issue of Good Housekeeping has me thinking how advice on buying typewriters from 1957 might be of use to the collectors of typewriters today. If you’re one of the many thousands of people who haven’t bought a typewriter in years, you’re in for some surprises. Some of the gadgets offered on modern machines include easy-do ribbon changers, concave keys for finger comfort, automatic devices that show the number of type lines or inches remaining on the page, top plates that spring open at the touch of a button (to facilitate inside cleaning jobs), settings for light and for heavy touch, half-spacing to correct letter omissions or spacing errors, knobs to adjust the carriage speed to your own typing speed, special paper supports for post cards, practically noiseless type bars, and improved push-button settings for margins and tabulator. Often you can get typewriters to match the decor of your room, in pastels ranging from turquoise-blue to pink. You can usually choose a type style and size to match your whim, too; one manufacturer lists six sizes and 25 different kinds of type faces available in his portables. In an electric typewriter — which is plugged into a wall outlet like any home appliance — the type bars, carriage return, and operational parts are moved by electrical power rather than by “finger power.” The typist mere touches the keys lightly, and electricity does the rest, the action resulting in a uniformly typed page. How quaint the need for explaining an electric typewriter seems to this internet addict! Such information may be charmingly amusing, yes; but this article may also help collectors identify the age of vintage typewriters too. So feel free to click the image to read (or download) a larger scan.